Gilbane Building Company and Stantec team up with Quinn Evans Architects to deliver the long-awaited George Mason High School. What was once a vague dream for the Falls Church Community, is now becoming a reality thanks to the Gilbane and Stantec design-build team. 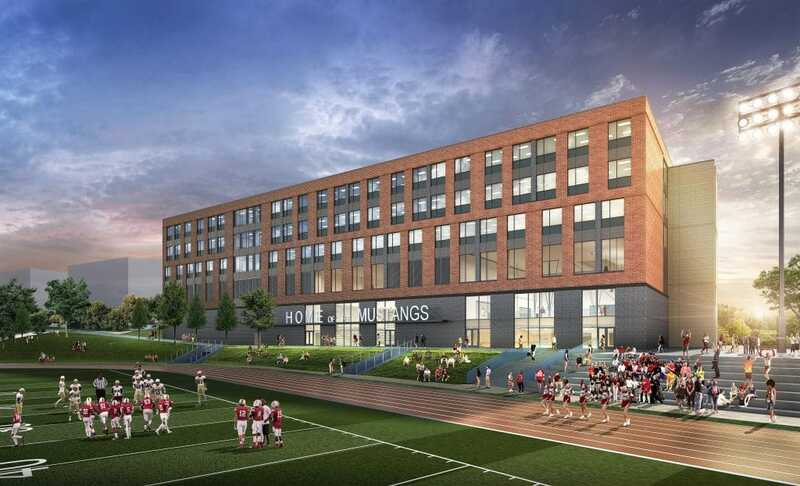 After many meetings, deliberation and collaboration, the Gilbane team was awarded the design-build construction of the new, $108 million high school in Falls Church, VA. Flexible and collaborative areas are a priority for the school. Throughout design development, the team provided solutions to address these needs. For example, the third level will act as an innovation commons. A learning stair will lead students from the commons to collaborative breakout areas on the fourth floor. To accommodate future flexibility, a three-classroom wide breakout area will be included on both the third and fourth floors. If enrollment increases significantly, this area can be fit-out for classrooms. Designed to LEED Gold and Net Zero Ready, sustainable elements were a high priority for the community. In addition to green roofs on the third level, the building will include geothermal wells and bioretention areas around the site. Gilbane has developed a highly technical construction plan to ensure continuous and smooth operations for the community. The team will use summer months to accomplish work best done when students and staff are away and incorporate any modifications to circulation so that they are in place when classes start back in the fall. During the school year, our team has developed a plan to maintain school activities and safety, while most effectively circulating traffic patterns, pedestrian walkways and campus parking for staff and students at both the current George Mason High School and the adjacent Mary Ellen Henderson Middle School.